Imagine you’re talking to a close friend who is grieving and she tells you she’s frustrated because she doesn’t think she’s coping well. You know she has made many active efforts to constructively cope such as attending a support group and journaling about her grief and you believe she has been doing as well as can be expected, but she feels like she has been making very little progress. She wonders whether she is strong enough to handle her grief and compares herself to others in her grief support group, who she believes are coping better than she is. Keeping in mind this friend typically appreciates feedback – what would you say to her? Take a few minutes to think about it…doot doo doo…think think think…aaaaaaaaand we’re back. So, what did you say to your friend? I’m guessing most of your responses were compassionate, supportive, and encouraging. Am I right? I bet I’m right. Now, I want you to think about a time when you were the frustrated and self-critical grieving person. Even if the content of your criticism was different, the self-reproach was the same. What, at that time, did you say to yourself? Did you show yourself the same support and encouragement that you gave to your hypothetical friend above? Were you even open to your own self-kindness and compassion? If the answer to this question is, “No, I was not kind to myself”, you are definitely not alone. It’s puzzling, isn’t it? Why do we respond to our friends with understanding, patience, and compassion, but we respond to ourselves as though were hard-nosed football coaches running drills before the big game? You call that grieving? At this rate, you’ll never feel better! Now take a lap! If you think about it, most of us are taught to be kind to others at a very early age, but lessons about being kind to oneself are far less overt. This is an unfortunate reality because self-compassion has been linked to greater levels of things like increased resilience and well-being and lower levels of depression, anxiety, and stress. Self-compassion is useful and important, especially during times of difficulty and suffering. Sadly, I worry many people won’t even make it past the title of this article because they dismiss it as buzzwordy, or because they confuse self-compassion with things like self-indulgence or self-pity. But self-compassion is not the same as pitying or indulging oneself. It’s not self-centered, it’s not weak, and it’s not letting yourself get away with things without a second thought. One thing psychologists must do when researching and applying a concept is define and describe it. Sometimes these definitions closely match our understanding of the term in broader society, and sometimes they are a little different. So, you may have your own ideas about what self-compassion and self-kindness mean, but when we refer to self-compassion we’re referring to it as it’s defined by Kristin Neff who is quoted above. You can explore this concept a little on your own on selfcompassion.org, but we’ll briefly discuss it as it relates to grief below. Showing self-kindness means being understanding, accepting, and compassionate towards oneself, rather than harsh and critical. Self-kindness does not require a person to ignore their suffering or to immediately let themselves off the hook for their wrongdoing. Instead, it asks people to approach experiences like these with a more flexible, open, and understanding stance as opposed to one of shame and condemnation. For many, self-kindness is easy to understand, but hard to live. People often feel their self-criticism is what keeps them in line. They fear that without it they won’t know when they’ve done something wrong or push themselves to be as good and productive as they can possibly be. But there’s no evidence to support this notion and such self-criticisms can create stress for the person and undermine their sense of self-confidence and capability. Grief is an overwhelming experience that challenges a person to cope while simultaneously juggling a complex and complicated life filled with jobs, bills, housework, parenting, friends, family, etc. To make things even more challenging, grief sometimes involve feelings of guilt, regret, shame, low self-esteem, and loss of identity. So quite often people find themselves struggling with thoughts like – “I’m not strong enough to deal with this.” “I don’t know who I am anymore.” “I should be feeling better right now.” “I wasn’t a good wife/husband/son/daughter/etc” “The death was my fault” So, grieving people should be especially mindful of their self-critical voice and how loud it has become. Acknowledging our common humanity doesn’t deny our differences, rather it asks people to focus instead on how we are the same. It may seem abstract to some, but for others, it may be comforting to remember that suffering and imperfections are a part of the broader human experience. Everyone suffers, everyone is imperfect, so we are not abnormal, wrong, or different when we experience these things and we do not need to isolate, separate, or hide. I think this is especially relevant to grief because almost everyone will experience the death of a loved one at some point in their lives, but people often get caught up in thinking about how their experiences differ. Take WYG for example, we often talk about how grief feels different for everyone and no two people grieve in the exact same way. We also often hear people comparing their losses, measuring their suffering against another, or saying, “no one understands me (us)”. While we don’t deny the fact that no one can fully understand another person’s pain, my question would be, what purpose does focusing on these differences serve other than to further isolate and separate? When we focus on our common humanity we see that, although I don’t know the depths, colors, and shapes of your pain, I do know that you are suffering because I have suffered too. I won’t dive too deeply into mindfulness because this is a bigger concept, but we’ve written about it here. 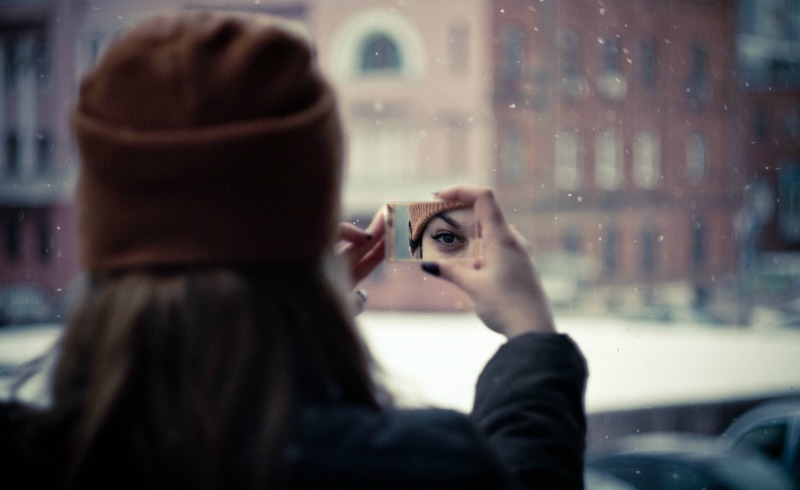 Mindfulness fits into the bigger picture of self-compassion because one must be present with their experiences and emotions in order to offer themselves kindness and compassion. Just like the friend who runs away at the first sign of a tearful lip quiver, if you can’t be present with your own grief, then how can you acknowledge it and offer yourself understanding? Well, I’ve managed to use up all our time talking about the concept of self-compassion without offering you any actual tools. That’s okay, another post for another day. In the meantime, I want to challenge you all to show yourself kindness and compassion by following the (very simple) acronym below. B – Be kind to yourself. We’ve already discussed this one. R – Respect your body by not overindulging alcohol, drugs, and bad food; by getting enough sleep, and by moving around at least a little every day. E – Engage with others in big and/or small ways. We’re not asking you to bloom into a social butterfly or anything. Just try not to isolate. If you haven’t been around other people in a while, go to the local coffee shop or go out for a walk and wave to your neighbors. A – Allow your emotions to ebb and flow. Don’t run from them. Expect that grief emotions will bubble up, their intensity will rise, and they will wash over you and recede. H – Allow yourself space and time to remember, honor, and to connect with your loved one’s memory and their continued impact on the world. E – Your critical voice has a lot of expectations about what grief should be like and how you should cope. Remember, there are very few “shoulds” when it comes to coping with grief. Everyone copes in their own way and at their own pace. So give yourself a break. 9 responses on "The Need for Self-Compassion in Grief"
Another excellent article and very relevant. 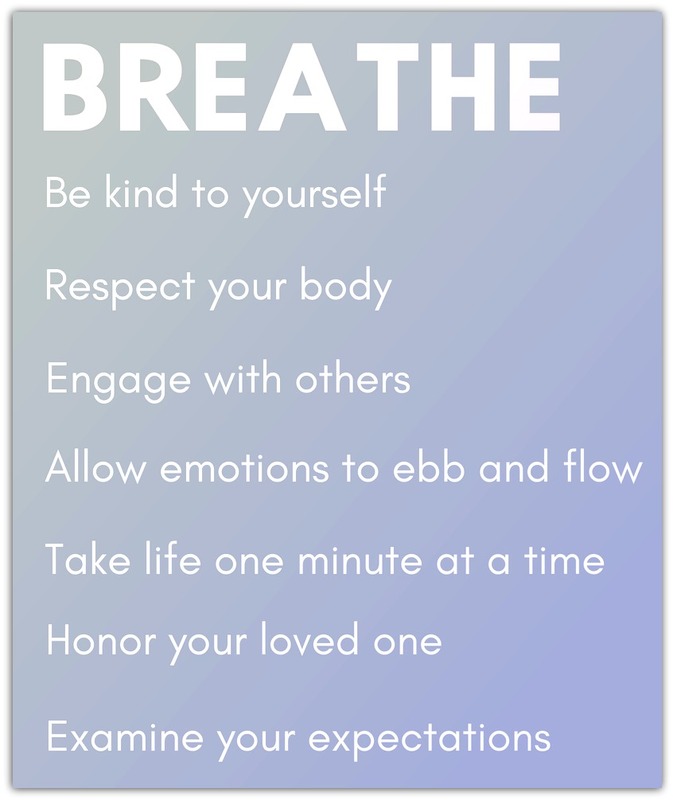 I also love the BREATHE acronym and will try to remember it and do it. This article came on time to understand my feelings of anxiety and solitude after losing my sister to Leukemia on 09/29/2018 after 7 months of battle with chemotheraphy. I was always hoping for a cure or healing for sometimes at least 5 years like I read. My sister and I we planned many times to retired in the same retirement home together, although I was 7 years older. My hobby will be e-reading and her hobby will be crocheting. During her illness, she said one day, I don’t think we will retire together because God is calling me and I must get ready for Him. I told her, please don’t talk this way, you’re making me sad and sick to my stomach. We’ll retire together because then we’ll have all the time in the world to talk and share everything together like when we were kids. Deep in my soul I knew I couldn’t stop her, and she couldn’t stay, we both knew God’s will. So one day she said I’m not getting better, the storm is real, I need to tell you that I am graceful to God for given me a wonderful sister. He is merciful by seeing me go under your tender care with so much love, she told me she knew how much I love her, she knew I would do anything to make her well. With much tears in my eyes I cried and hugged her, it was so important to hear her say that she knew how much I love her. I am still dealing with my pains but I am holding bit by bit day by day knowing that she felt my deep love for her. After the mess I made with the deepest relationship I ever had in my life, after possibly hurting dad irrevocably just before he died, he who loved me so and whom I regarded so deeply, I am suddenly so socially confident and even intuitive, and poised, too, and worry-free. But what is the point, as I have paid the ultimate price. Such a price it was. I am new to this group. It has been over two years since I lost my two step children. They are alive and this makes me so very happy. I am no longer allowed to see them. Once there mother and I divorced that right was taken from me. The pain is so deep and unrelenting at times. I look back and see that I blame myself for everything. On those occasions that I don’t blame myself I blame there mother. I am so filled with sorrow and nothing feels normal anymore. The love and joy for life I had cannot be found. I have been running from these feeling and finally understand It won’t help. The crazy thing is while Yes I have been running from them they are inescapable. I ran and ran but never got away from any painful feeling. I remain angry, hurt, betrayed and horribly frustrated. I isolate and sleep so much. Self pity is my best friend. Your articles have been so timely so often for me. This one hit me hard. I’ve been mad at myself for failing to keep up with housework, or for eating poorly because I just don’t have it in me to cook. I hate that I’m still using paper plates after 5 months, because I should have the energy to do dishes. But I don’t. I need to step back and remember how fresh and new this grief thing is. That I’m still getting used to my new normal. Perfect timing. I’m feeling so sad over the death of my brother as we near the one year anniversary mark. I’m so filled with sorrow and sadness at his passing. But I know I have to just feel it and I can get through this … and accept myself for just letting the feelings flow. Self care is high on my list this holiday weekend.